The theme was redemption and it was apropos to our current environment. 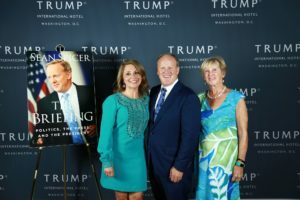 The venue was the Trump International Hotel in Washington DC where Sean Spicer was promoting his book “The Briefing.” The reviews were in and Spicer’s book was skewered by nearly every media outlet for being both banal and inaccurate. The mistakes that were highlighted by the Wall Street Journal and others were so de minimis that it was apparent this was part of the media hachet job inflicted on any loyal member of the Trump Administration. I wonder if Bill and Hillary Clinton’s books were subject to such unrelenting critique; or if the Obamas will have to endure the same nitpicky assessment. Spicer sat there patiently posing on the red carpet with signed copies of his book. There was certainly a who’s who of past and present administration attendees including current Press Secretary Sarah Sanders; former Deputy Assistant to the President Sebastian Gorka; Counselor to the President Kellyanne Conway; Representative Lee Zeldin; and former Chief of Staff Reince Priebus. However, there were also a slew of no-shows including Lara Trump who was listed as a host on the invitation and Trump officials Steve Mnuchin, Wilbur Ross, and Elaine Chao who were supposed to attend (according to Page Six). Trump Jr. showed up with girlfriend Kimberly Guilfoyle for the last two minutes of the 6-8 PM cocktail party. 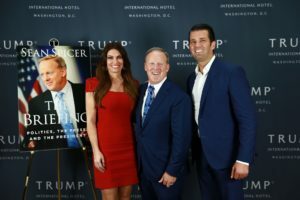 I am dubious as to “The Hill’s” claim that Spicer paid $10,000 to rent out the Hotel lobby for two hours when more than half the lobby was open to the public. Nonetheless, the event was packed with over 250 elite DC residents including those who had worked hard on the Trump campaign such as Jason Miller, Boris Epshteyn and Matt Rich. 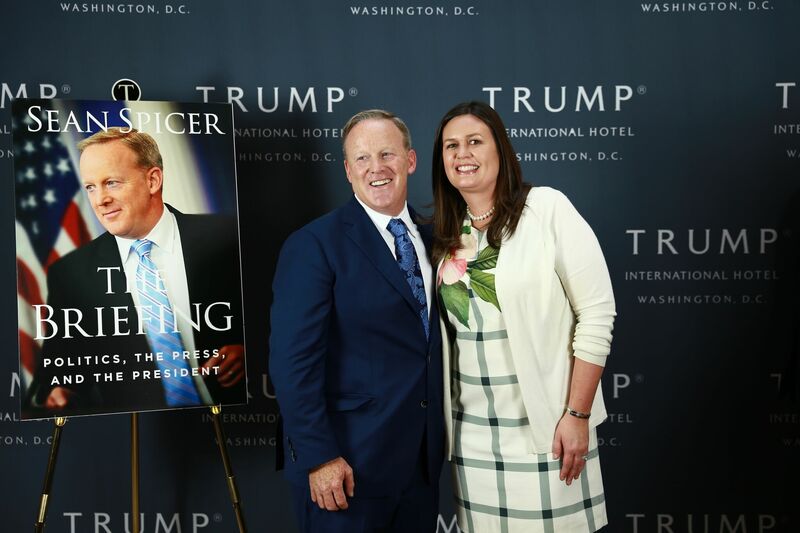 I stayed in DC all week to attend the Pearl Street Warehouse Spicer book launch on Tuesday which contained fewer boldface names and less excitement. I was able to witness firsthand the explosive renaissance of Washington as illustrated by megastar Tom Cruise’s decision to hold the U.S. premiere of “Mission Impossible” at The Smithsonian Museum this past Sunday. While Tom Cruise was nowhere in sight this evening, I spotted someone with equal screen time on television; the ubiquitous “My Pillow” CEO Mike Lindell-who has been my television companion for over a decade of sleepless nights. I have never tried Lindell’s magical pillow but I find his voice surprisingly soothing at 3 AM in the morning. Lindell told me he was a former crack addict up until January 16, 2009 when he became a born again Christian. He said everyone can relate to the problem of addiction and what the country needed was stories of hope. He said addiction was hard work as it hurts to break one’s moral code and deceive others; however, Lindell felt it was necessary to remove the shame and stigma associated with it. Lindell is now using his fame to help addicts and those suffering with crises. Former Sergeant Michael Trost, who endured unbearable pain after being shot five times in Afghanistan in 2012, concurred with Lindell on the need to heal after tragedy strikes. Rost who faced a long five year road-to-recovery was pumped with Methadone and Oxycodone during his five year convalescence after losing his right leg and damaging his hand to the point where doctors had to graft his big toe onto his hand in an 18-hour surgery. Rost is starting a farm in Tennessee to help wounded veterans who are crippled both mentally and physically by their injuries with the message that even though you are messed up you need to get up, move forward and find something you enjoy doing. Standing nearby was another warrior, former New York City Police Commissioner Bernie Kerik who spent three years in prison for minor tax fraud. Kerik stood somberly in the corner with few recognizing this New York legend-this was a DC crowd. Kerik was marveling at the magnificent job Trump was doing in reducing Hispanic and Black unemployment. Friends with the President for 20 years, he was proud of Trump for moving the embassy to Jerusalem something no previous leader had the courage to do. Kerik remarked that fulfilling campaign promises was an oddity in politics and he was amazed by Trump’s accomplishments in National Security with North Korea and ICE. “Law Enforcement finally has a leader they can depend on” said Kerik, who acknowledged that the President can sometimes be brazen and cocky in order to get the job done. He then made a stunning assessment that when the Presidency was over he felt a study should be conducted on how Trump was able to compartmentalize; Kerik had never seen anyone so relentlessly attacked able to work so efficiently on each and every issue. Another impressed attendee was counselor to the President, Kellyanne Conway who was wearing a Nine West dress which she bought at a 40% discount. Conway said the greatest accomplishment of the President was the prosperity and opportunity he had given to all Americans and was proud that Trump never apologized for trying to advance his Country. Conway has kept a relatively low profile over the past year but I could hear her telling a reporter that she was not afraid of tough questions but disliked intransigence and disrespect. As the evening concluded at 8 PM, the crowd; many of whom had either figuratively or literally come under fire, felt gratified by the opportunity to pay homage to fellow compatriot Sean Spicer.